ORAMA Editions is a Greek publisher of Road & Travel maps, covering the whole of Greece, in different formats. 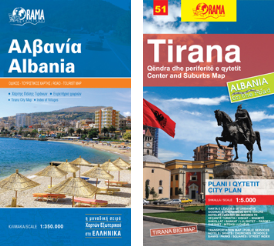 ORAMA Editions offers unique series of maps, in various scales, to suit every requirement. The only atlas on the Greek market with a scale of 1/250.000! Maps, large format, with hard cover, GPS compatible. Includes city plans, information about accommodation, sights, beaches, photos, history, useful phone numbers etc. Maps Large format, with hard cover, GPS compatible, includes information about accommodation, sights, history, photos, beaches, useful phone numbers etc. Maps include street index and represent hotels, churches, schools, squares and public services, useful telephone numbers, pubic services location etc. Very useful for trekking, hiking, cycling, climbing, 4x4, endure etc. These maps will be replaced in the future by the series STEP BY STEP. A new series that includes specialized trekking maps, suitable for outdoor activities such as climbing, trekking, hiking, 4x4 routes or endure routes etc.